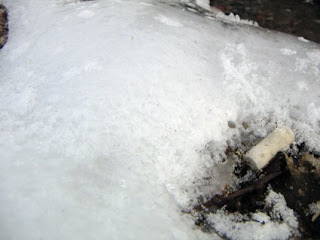 thin icy cover formed over snow. in Kanta-Häme "riite" means a very thin layer of ice on water, for example on the surface of a lake. The usage of the word to mean "a very thin layer of ice on water" extends to all of Häme, including both Kanta- and Päijät-Häme. Riite is typically the first signs of autumn, when small puddles get a thin cover of ice during the nights. The same thing may also happen during the spring and "halla" which means "a night of below-zero temperature during the summer". Riite in Satakunta is more like water becoming to be ice on water, not yet a solid layer. It's a swimmer's nuisance, it makes many many small cuts to your skin.